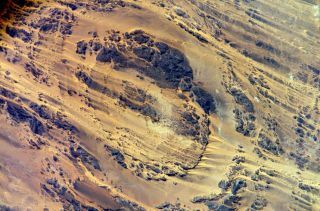 Astronaut Clayton C. Anderson tweeted this picture from space, a view of Aorounga Impact Crater, southeast of of Emi Koussi volcano in Chad. A major meteorite impact on Earth could spell doomsday — or not. To better predict what could be in store if a giant space rock slammed into our planet, scientists have built a new model to simulate the seismic fallout from such an event. The model predicts how seismic waves would spread through Earth after a meteorite collision. It's the first to take into account the planet's elliptical shape, surface features and ocean depths. In contrast, previous models have assumed Earth is perfectly spherical and featureless, with nothing to disrupt a meteorite's impact. "After a meteorite impact, seismic waves travel outward across the Earth's surface like after a stone is thrown in water," research leader Matthias Meschede of the University of Munich said in a statement. "For the Earth, these calculations are usually made using a smooth, perfect sphere model, but we found that the surface features of a planet or a moon have a huge effect on the aftershock a large meteorite will have, so it's extremely important to take those into account." The researchers used their new model to simulate the collision that created the Chicxulub crater in Mexico around 65 million years ago. This crash, which was 2 million times more powerful than a hydrogen bomb, is thought to have wiped out the dinosaurs and much of Earth's life at the time. The new study showed that the seismic waves resulting from the impact would have been scattered and unfocused, causing less severe ground displacement, tsunamis, and seismic and volcanic activity than previously thought. "But our results go beyond Chicxulub," Meschede said. "We can, in principle, now estimate how large a meteorite would have to have been to cause catastrophic events. Our model can be used to estimate the magnitude and effect of other major impacts in Earth's past." NASA and astronomers around the world regularly keep track of potentially hazardous asteroids. NASA announced last month that it has found about 90 percent of the largest, most dangerous space rocks near our planet. To that end, NASA is tracking a huge space rock, the asteroid 2005 YU55, which is the size of an aircraft carrier and will fly close by the Earth, inside the orbit of the moon, on Nov. 8. Though this is considered a very close pass, the rock is calculated to pose no risk to planet Earth. Meschede developed the new model with colleagues while visiting Princeton University through the Visiting Student Research Collaborators program. The researchers describe their new model in the October issue of Geophysical Journal International.